I like the odds better in Lancaster County, Pennsylvania — Pennsylvania Dutch Country. You know spring is in sight because every year, at the end of February, the Amish there have what’s known as mud sales. They’re held on several weekends leading into the warmer months. Anyway, mud sales are the main fundraiser for many local fire companies in traditionally Amish communities. 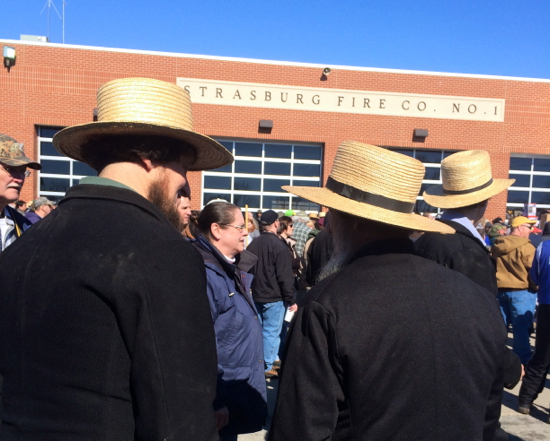 In fact, some Amish are firefighters. It’s like watching Witness for real, as the Amish interact with the English — in other words, the rest of us — on their home turf. Mud sale pretty much says it all. The name refers to the ground after the winter thaw. This year’s first sale kicked off yesterday. After weeks of brutal snow and ice in the Northeast, Mother Nature decided to play nice. The sun finally made an appearance and it was so warm, some jackets were shed. The heat wave brought lots of gooey mud. Good thing I brought along some icky old running shoes that I didn’t care about to change into. My suede boots would have been done for. I’d never been to an auction before, let alone a traditional Amish auction. There were several going on at once. The Amish auctioneers were adept performers. Their quest for bids sounded like yodeling at a very fast clip. Mountains of merchandise moved pretty quickly. And so was the camaraderie in this relaxed setting. Unlike the tourist shops lining Route 30, the main drag in Lancaster County, conversation flowed more freely. There were snippets of Pennsylvania Dutch language — a form of German — all around. I wasn’t about to do anything as gauche as ask for an Amish buggy ride. But I did get to peek inside, and was shown where the battery was installed to power turn signals. Though cellphone cases were for sale, the Amish are divided on the use of cellphones. Some acknowledge they’re necessary for business, but also see their overuse as a threat to family life. That preparation for the chicken corn soup starts in September with the corn harvest. And the egg noodles for the chicken pot pie (no piecrust is involved in the the Amish version) are homemade. That the picture-perfect baked goods are all local. That the Amish like their sinfully rich whoopie pies (cream-filled cakes) as much as the rest of us. That it’s very bad form to stick a camera under their noses. If you want a picture, get it from a side or back angle, or from a distance. Being polite goes a long way. There’s still plenty of time to experience a Pennsylvania Dutch mud sale. Here’s the remaining schedule. This entry was posted in North America, Road trips and tagged Al Roker, Amish, Lancaster County, mud sales, PA, Pennsylvania Dutch Country, Witness. Bookmark the permalink.